Congratulations to "Jonetta", the winner in Jacki's giveaway. Please contact JUST ROMANTIC SUSPENSE to claim your prize. Thank you to all who participated! 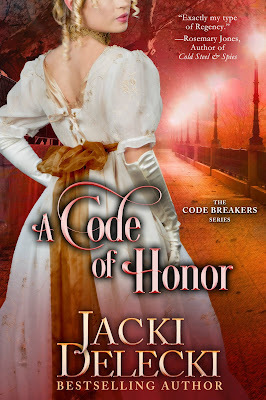 I’m getting ready for the release of book 6 in my Code Breakers series, A Codeof Honor, which releases July 24. This is another Regency romantic suspense…inspired, in part, by real historic events. In A Code of Honor, Jack Bonnington is recruited to join the Code Breakers but the assignment he’s given is not what he expected. Lady Abigail Lyon is also being recruited for the cause. In this case, it’s her intelligence and knowledge the Crown requires, qualities she’s kept hidden to avoid censure from her family. Lady Henrietta, who but a minute ago appeared to be barely awake, was intense and focused. Her green eyes drilled into Abbie’s. When their assignments cross paths, Jack and Abbie must pose as a young couple falling in love, but all too soon the line between duty and truth blur. Can a scholar and a rake find true love in the midst of intrigue and conspiracy? my imagination, certain elements are straight out of history. In A Code of Honor, troops must be stationed along the coast at Dover to repel attack and invasion by France. 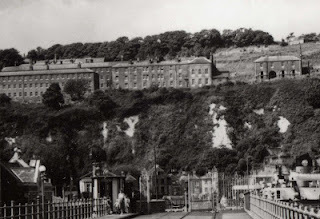 I included elements in the story based on the Grand Shaft and Barracks of Dover which were built in the early 19th century and still exists today. These tunnels and subterranean spaces provided housing and safe passage for the military forces defending the British coastline. 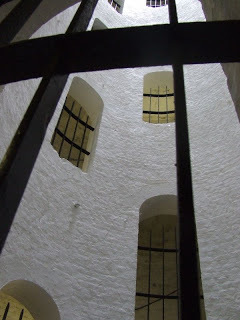 I was fascinated by this historical detail and knew it belonged in one of my historical romantic suspense stories. I hope you enjoy Jack and Abbie’s story in A Code of Honor. To celebrate my new release, I’m giving away a digital copy of the book plus a $10 Amazon gift card. For a chance to win, comment with a fact from history that fascinated you. It can be a site you visited, something you learned from a documentary or just trivia you picked up somewhere. Giveaway ends 11:59pm EST July 23rd. Due to GDPR regulations you no longer need to submit your email address in the comments. If you have been selected as a winner your name will be posted at the top of the post. You may then contact maureen@justromanticsuspense.com to claim your prize. Your email address will be shared with the author/publicist providing the giveaway. I’m actually fascinated by the women in Bletchley Park, the female British cryptanalysts of World War II. My husband introduced me to the television miniseries, The Bletchley Circle. Highly encourage everyone to check it out. It’s very well done. Forgot to provide my fact! Over 8,000 women were recruited and worked there, representing ~75% of the workforce at the site. Fascinating! The miniseries sounds very interesting too. The Salem witch trials always held a fascination for me. Through June to October of 1692, authorities hung nineteen citizens for witchcraft. Today, we know that something far more sinister than sorcery caused the hunts. Oh yes. Always such an interesting thing to learn about! So many stories out there. Oh, wow, yes the secret city concept is so cool! And what an amazing vacation that would be. I hope you get to do it! There is so much to learn about there! Do you have any favorite facts? Yes, so much out there! Are there any time periods you like the most? We just got back from a trip to the Northern part of New York. The area was very important in the War of 1812. The Battle of Plattsburgh on Lake Champlain was the pivotal battle in that war. It was fought on September 11, 1814. There is a fort on the northern end of the lake that was started but never finished. It was half in America and half in Quebec. Locally it was called Fort Blunder. The only way to get to it is by boat or you can wade out when the water is low. We noticed it is now for sale. 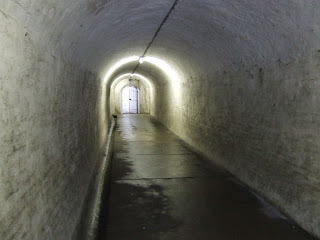 Along the St. Lawrence River and the shore of Lake Ontario there are many more points of interest relating to the war. That sounds like such a wonderful trip! And with so much history. It's such an experience to go to places and realize all the things that have happened there. I recently watched a historical documentary on emergency baptism. Apparently, midwives were authorized to administer it as well. Emergency baptism! And interesting that midwives were able to do it. I love learning about the hours it took to build the Great Wall of China! The Great Wall has so many interesting stories! Good one! I've been amazed at the famous women pirates in history. One is Grace O'Malley who was a 16th Century daughter of a wealthy Irish shipping business man. She inspired many interesting stories. Also the Chinese pirate, Cheng I Sao, reportedly a prostitute who married a wealthy pirate and took over when he died.She had 400 ships with over 70000 sailors!